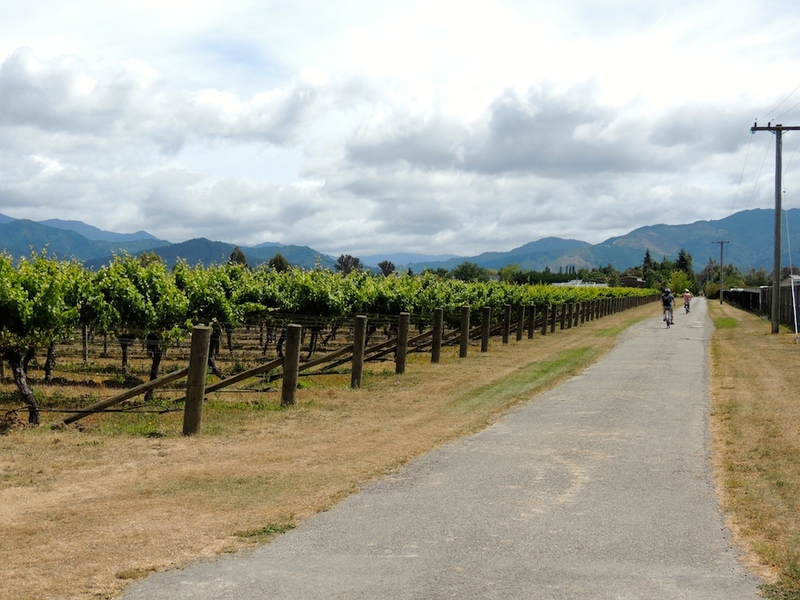 Cycling the Vineyards of Marlborough, New Zealand – These Two Eyes! Two of my favorite things include sunshine and wine. 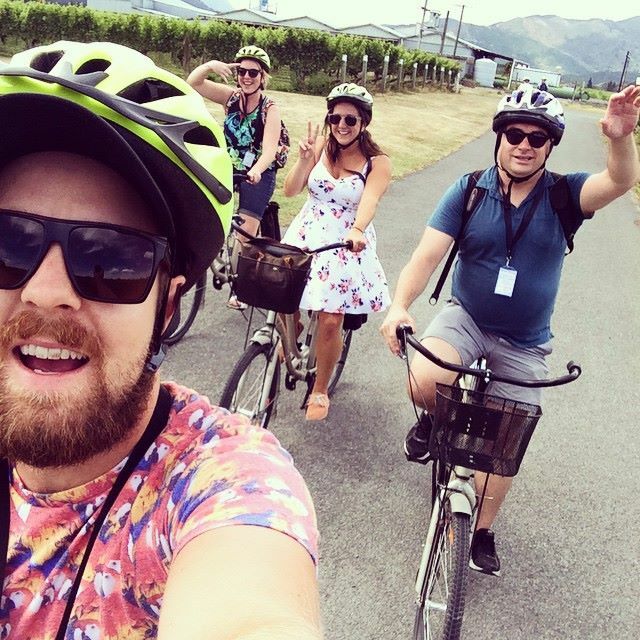 Throw me on a bike on a cloudless day and give me a map of the boutique vineyards in the heart of the Marlborough wine region and honestly, it was one of the best tasting experiences I’ve ever had. Tasting in Marlborough has long been on my list of wine regions to conquer. In fact, considering its remoteness in a quiet northeast corner of the South Island, New Zealand, I was starting to fear I would never get an opportunity to go. Partially because I think my appreciation for its world-renowned Sauvignon Blanc grape outwore its welcome on my pallet years ago. Secondly, it’s just not super convenient to get to. I have a special fondness for New Zealand. I’d even go as far to say I love it. If you asked me to live there for a short while I’d be hard pressed to say no. Another reason it was crucial that I get myself to Marlborough. 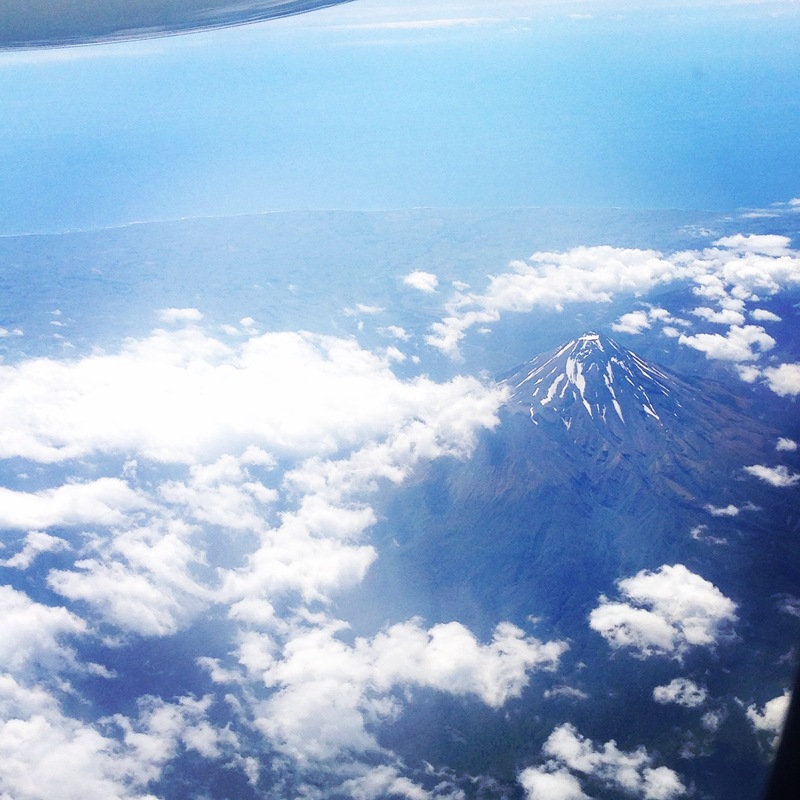 My favorite part about New Zealand is flying over it. With the terrain ever changing, lush green contrasted against snowy mountain peaks and azure water, it’s absolutely breathtaking. Every time, I’m reminded again of my first time, looking out of the airplane window in 2011, and it’s always equally as majestic. In terms of getting to Marlborough my friends took the Interislander Ferry across from Wellington to Picton. 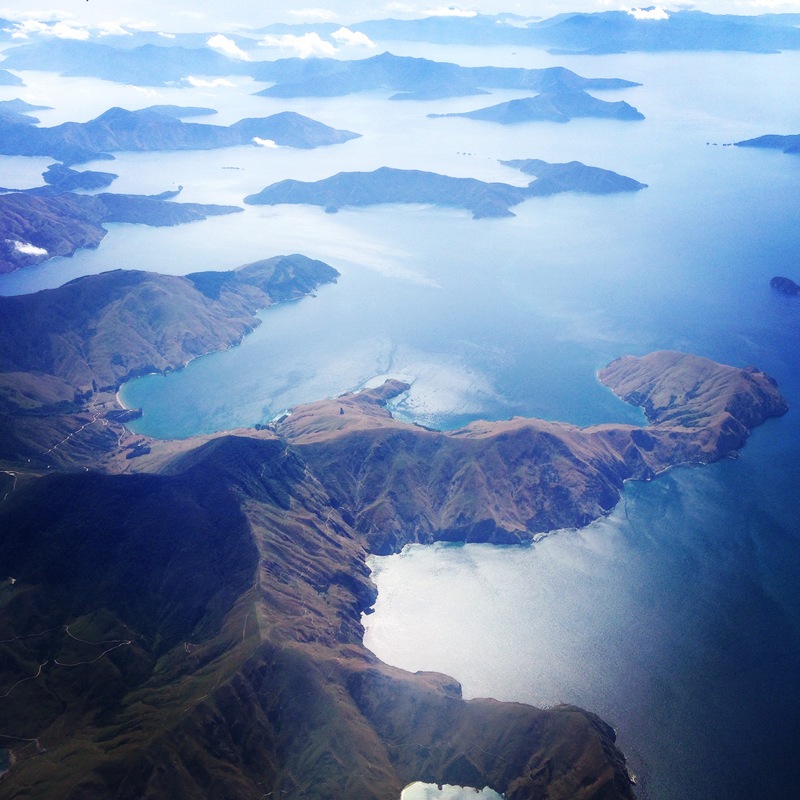 At the same time I witnessed from above the stunning alcoves of the tiny islands their boat wove between while flying down from Auckland to Blenheim. Knee deep in my inflight magazine I took a quick break to gaze out of the window and my mouth involuntarily dropped. Just below the clouds sat a volcano. This was just before I passed from the North Island down to the South Island. Shortly afterward the striking coastline came into view. My three Australian friends greeted me at the Blenheim airport with a big “Welcome to New Zealand” as if they were locals. 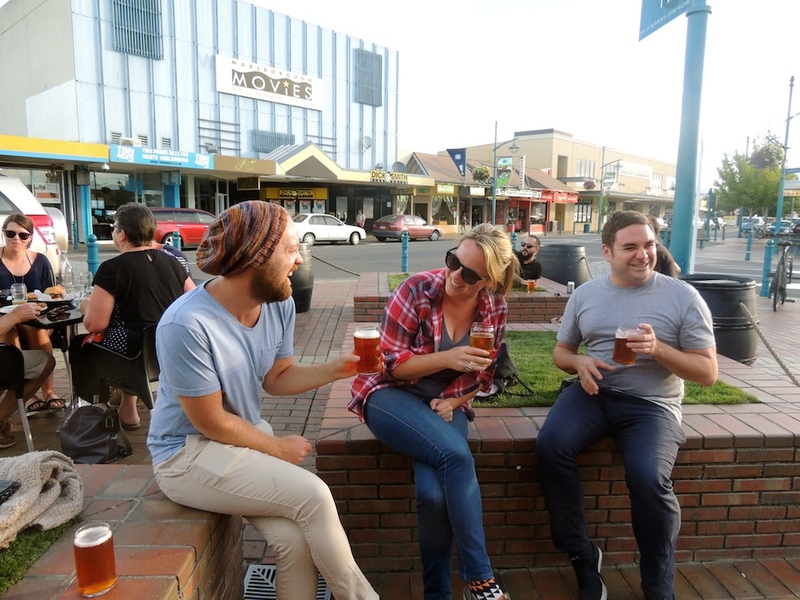 And while Blenheim isn’t much to offer up socially, it is just on the cusp of the vineyards and has a range of accommodation and a few noteworthy bars and restaurants, such as Scotch. We stayed in a small cottage in the back of a B&B called Tresco. The owner Ian and adorable terrier Dudley were friendly and accommodating and it was only a short 10-minute walk to town. At night, the residential streets were quiet and the stars shone bright. It is true the Milky Way can be seen on this side of the world. But enough of Blenheim (jokingly termed phlegm-em). Let’s talk wine. 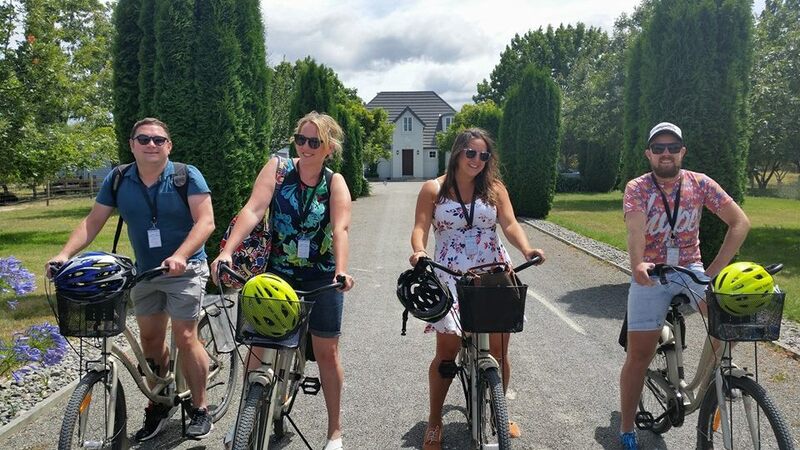 Wine Tours By Bike have a great thing going. Family run by Steve and Jo Hill, they made it all so easy. That’s the thing; the day was more or less completely on our own terms. 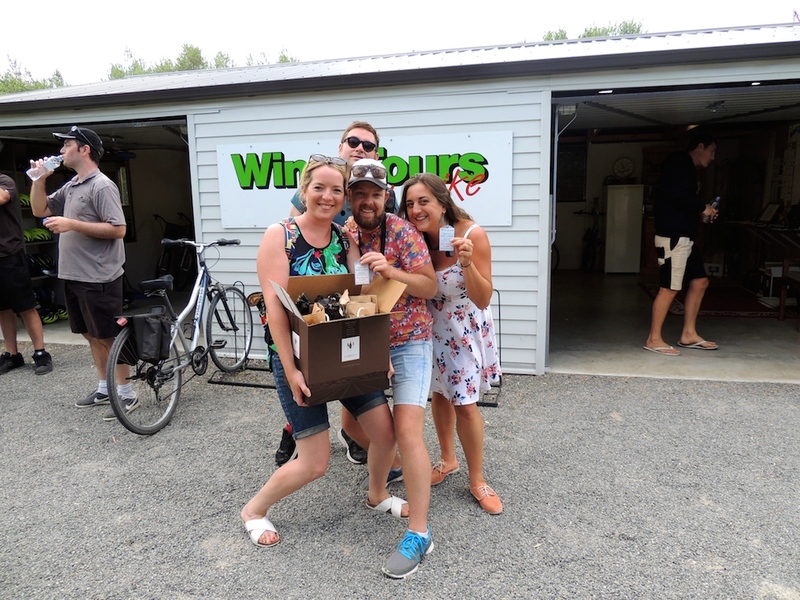 We booked in advance to be picked up from one of the three 5-hour long timeslots and were greeted with a big smile and handshake from Fred, Jo’s dad who drove us to the bike shed in Renwick. Set on a beautiful B&B property Hillsfield House, we were instantly asked to pick a bike from the lot parked out front. Told that just like a person no bike is the same, we tested them for height and seat comfortableness before analyzing how large each of our heads actually was during a helmet fitting. The award went to Rob. Steve gave us an amazingly detailed, yet brief overview of the vineyards in the vicinity of Renwick while we, along with some locals which are always a good sign, observed as he pointed them out against a white map pinned against the wall. My group then huddled together, our paper copies in hand and highlighter at the ready, mapping out how to tackle the afternoon and fit in all of our top spots. Water bottle, check. Lunch reservation, check. Social media post, check. And we were off! Wobbling a bit when we set out, we eagerly headed to our farthest destination first, yet the most boutique. Te Whare Ra’s small quiet property impressed us with both their Riesling D (dry) and M (medium) so much that none of us left empty handed. In fact, it was my most favored tasting of the day and my only regret is not purchasing a case. I traveled on, steadied on my African cruiser bike, with a smile from ear to ear. We dashed through the back of a vineyard on our way to another, taking shortcuts on dirt paths as we were hugged by the vines and the monstrous mountain peaks at the perimeter towered over us. The sun was hot, but in a good way. Then, the wind picked up and it was so strong, peddling against it turned our leisurely cruise into a battle of resistance. At Giesen we had a delicious vintage platter for lunch yet an offensive wine host ruined the experience unfortunately, so much in fact I wouldn’t recommend a visit. At Hans Herzog it was worth the cost of a tasting to be blown away with their exquisite presentation. It was the only Sauv Blanc I purchased in Marlborough, and for the cost it’s a keeper. Framingham won our hearts with free shipping to Australia so of course we bought a case between the four of us, but not without Mary Jo’s amazing attentiveness in pouring our Riesling flights. We finished the day lounging on bean bags on the lawn at Forrest, where fellow American Katrina won me over with their 2011 Chenin Blanc. Peddling back at the end of the day, still smiling while taking in the landscape, the pureness of the area and of the wineries really took hold. In fact, while I had a general distaste for what I had assumed was the mass production of sauvignon blanc, biking through the region and seeing the smaller farms and family vineyards gave me a whole other appreciation for it. But also, more impressive was the execution of other varieties likes riesling, pinot gris and pinot noir. 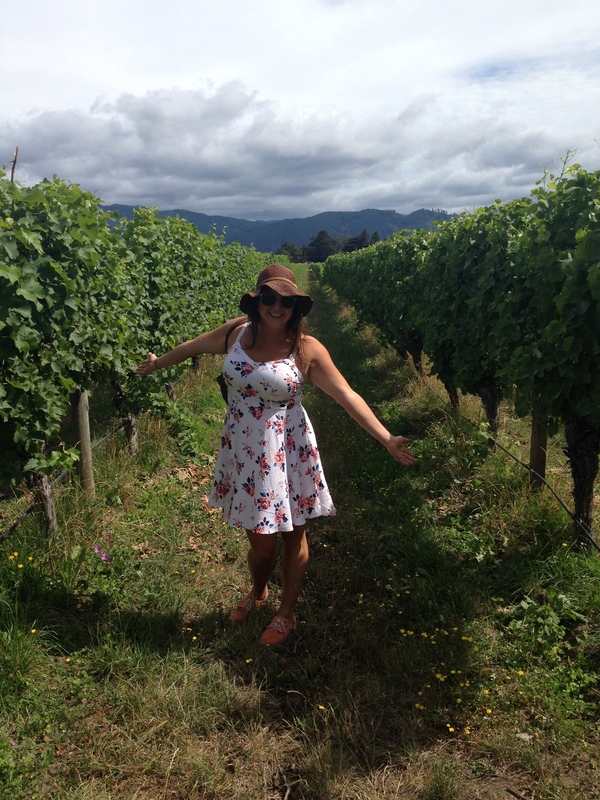 I’ve done a lot of wine touring, but cycling and tasting through the vineyards of Marlborough takes the cake! Settling in around the picnic table back at Tresco later that evening we barbequed local fish and vegetables while sipping some of our favorite wins from the day.